The Lone Star State continues to take pride in doing its own thing. After all it has a legacy to uphold since its very construction — that of fierce and outspoken independence. But, sometimes this leads to blind political arrogance, soon followed by growing paranoia. You see, newly minted Texas Governor Greg Abbott has a theory that the US military is about to put his state under the control of martial law. So, he has deployed the Texas State Guard to monitor any dubious federal activity and, one supposes, to curtail any attempts at a coup d’état. If I were Governor Abbott I would not overly trouble myself with a possible federal take-over of the state. After all, citizens will very soon be able to openly carry weapons in public — 20 million Texans “packing heat” [carrying a loaded gun, for those not versed in the subtle American vernacular] will surely deter the feds. It’s true that the paranoid worldview of right-wing militia types has remarkable stamina. But that’s not news. “We just want to make sure our guys are trained. We want to hone our skills,” Lt. Col. Mark Listoria tried to explain in vain. One wonders what Listoria was thinking to himself as he walked to his car after two hours of his life he’ll never get back. God bless Texas? Maybe not. “It is important that Texans know their safety, constitutional rights, private property rights and civil liberties will not be infringed upon,” Abbott said. The idea that the Yankee military can’t be trusted down here has a long and rich history in Texas. But that was a while back. Abbott’s proclamation that he was going to keep his eye on these Navy SEAL and Green Beret boys did rub some of our leaders the wrong way. 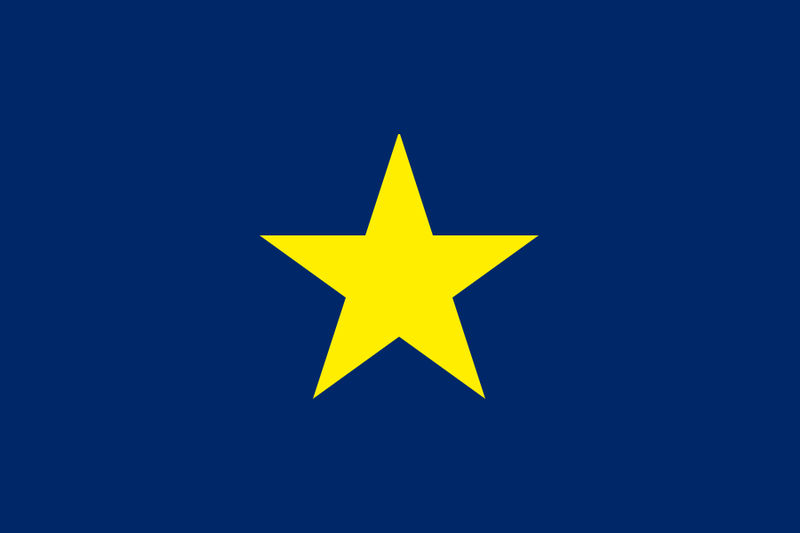 Image: The “Burnet Flag,” used from 1836 to 1839 as the national flag of the Republic of Texas until it was replaced by the currently used “Lone Star Flag.” Public Domain. Courtesy of Wikipedia. You could be forgiven for believing that celebrity is a peculiar and pervasive symptom of our contemporary culture. After all in our multi-channel, always on pop-culture, 24×7 event-driven, media-obsessed maelstrom celebrities come, and go, in the blink of an eye. This is the age of celebrity. Well, the U.S. had its own national and international celebrity almost two hundred years ago, and he wasn’t an auto-tuned pop star or a viral internet sensation with a cute cat. His name — Marie-Joseph Paul Yves Roch Gilbert du Motier, the Marquis de La Fayette, a French nobleman and officer, and a major general in the Continental Army. The Marquis de Lafayette, French nobleman and officer, was a major general in the Continental Army by the age of nineteen. When he returned for a comprehensive tour of the United States in 1824-1825, Lafayette was 67, and was the last man still living who had served at his rank in the Continental Army. Americans loved the aging soldier for his role in the Revolutionary War, and for his help after the war in smoothing diplomatic relations between the United States and France. Moreover, he was a living connection to his friend and mentor George Washington. The combination made him a celebrity who enjoyed a frenzied reception as he made his way through all 24 states. Lafayette’s visit inspired the production of souvenir merchandise embroidered, painted, or printed with his face and name. This napkin and glove are two examples of such products. Image: La Fayette as a Lieutenant General, in 1791. Portrait by Joseph-Désiré Court. Courtesy of Wikipedia. We humans are capable of the most sublime creations, from soaring literary inventions to intensely moving music and gorgeous works of visual art. This stands in stark and paradoxical contrast to our range of inventions that enable efficient mass destruction, torture and death. The latest in this sad catalog of human tools of terror is the “pain ray”, otherwise known by its military euphemism as an Active Denial weapon. The good news is that it only delivers intense pain, rather than death. How inventive we humans really are — we should be so proud. THE pain, when it comes, is unbearable. At first it’s comparable to a hairdryer blast on the skin. But within a couple of seconds, most of the body surface feels roasted to an excruciating degree. Nobody has ever resisted it: the deep-rooted instinct to writhe and escape is too strong. The source of this pain is an entirely new type of weapon, originally developed in secret by the US military – and now ready for use. It is a genuine pain ray, designed to subdue people in war zones, prisons and riots. Its name is Active Denial. In the last decade, no other non-lethal weapon has had as much research and testing, and some $120 million has already been spent on development in the US. Many want to shelve this pain ray before it is fired for real but the argument is far from cut and dried. Active Denial’s supporters claim that its introduction will save lives: the chances of serious injury are tiny, they claim, and it causes less harm than tasers, rubber bullets or batons. It is a persuasive argument. Until, that is, you bring the dark side of human nature into the equation. The idea for Active Denial can be traced back to research on the effects of radar on biological tissue. Since the 1940s, researchers have known that the microwave radiation produced by radar devices at certain frequencies could heat the skin of bystanders. But attempts to use such microwave energy as a non-lethal weapon only began in the late 1980s, in secret, at the Air Force Research Laboratory (AFRL) at Kirtland Air Force Base in Albuquerque, New Mexico. The first question facing the AFRL researchers was whether microwaves could trigger pain without causing skin damage. Radiation equivalent to that used in oven microwaves, for example, was out of the question since it penetrates deep into objects, and causes cells to break down within seconds. The AFRL team found that the key was to use millimetre waves, very-short-wavelength microwaves, with a frequency of about 95 gigahertz. By conducting tests on human volunteers, they discovered that these waves would penetrate only the outer 0.4 millimetres of skin, because they are absorbed by water in surface tissue. So long as the beam power was capped – keeping the energy per square centimetre of skin below a certain level – the tissue temperature would not exceed 55 °C, which is just below the threshold for damaging cells (Bioelectromagnetics, vol 18, p 403). The sensation, however, was extremely painful, because the outer skin holds a type of pain receptor called thermal nociceptors. These respond rapidly to threats and trigger reflexive “repel” reactions when stimulated (see diagram). To build a weapon, the next step was to produce a high-power beam capable of reaching hundreds of metres. At the time, it was possible to beam longer-wavelength microwaves over great distances – as with radar systems – but it was not feasible to use the same underlying technology to produce millimetre waves. Working with the AFRL, the military contractor Raytheon Company, based in Waltham, Massachusetts, built a prototype with a key bit of hardware: a gyrotron, a device for amplifying millimetre microwaves. Gyrotrons generate a rotating ring of electrons, held in a magnetic field by powerful cryogenically cooled superconducting magnets. The frequency at which these electrons rotate matches the frequency of millimetre microwaves, causing a resonating effect. The souped-up millimetre waves then pass to an antenna, which fires the beam. The first working prototype of the Active Denial weapon, dubbed “System 0”, was completed in 2000. At 7.5 tonnes, it was too big to be easily transported. A few years later, it was followed by mobile versions that could be carried on heavy vehicles. Today’s Active Denial device, designed for military use, looks similar to a large, flat satellite dish mounted on a truck. The microwave beam it produces has a diameter of about 2 metres and can reach targets several hundred metres away. It fires in bursts of about 3 to 5 seconds. Those who have been at the wrong end of the beam report that the pain is impossible to resist. “You might think you can withstand getting blasted. Your body disagrees quite strongly,” says Spencer Ackerman, a reporter for Wired magazine’s blog, Danger Room. He stood in the beam at an event arranged for the media last year. “One second my shoulder and upper chest were at a crisp, early-spring outdoor temperature on a Virginia field. Literally the next second, they felt like they were roasted, with what can be likened to a super-hot tingling feeling. The sensation causes your nerves to take control of your feeble consciousness, so it wasn’t like I thought getting out of the way of the beam was a good idea – I did what my body told me to do.” There’s also little chance of shielding yourself; the waves penetrate clothing. Related video courtesy of CBS 60 Minutes.